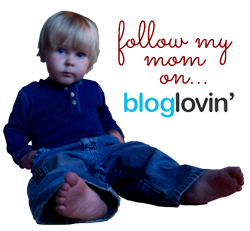 Do your kids love to paint? Do you hate the mess? The Pencil Grip, Inc. has created a solution to this discrepancy: the Kwik Stix 12 pk. Kwik Stix (priced at $11.99 for the 12 pack) are very similar to glue sticks in their feel, except instead of being filled with solid glue, they’re filled with solid tempera paint. Simply uncap, smear the paint on the paper, and re-cap after use. The paint inside even looks like a glue stick the first time you open it (in shape, not color). The best part is that the paint is dry within 90 seconds, so even if your child is impatient, there’s little chance of a mess (still not NO chance, as we learned with Small Fry, though!). When you do end up with a mess, however, the paint cleans up super easily; a wet rag handled the job with no problem – no additional cleaner required (not even soap). I’m not sure it would have washed up so easily off of an unfinished table, but since ours has quite the shiny coating (I’m not entirely sure what that’s called…), it wasn’t a problem. 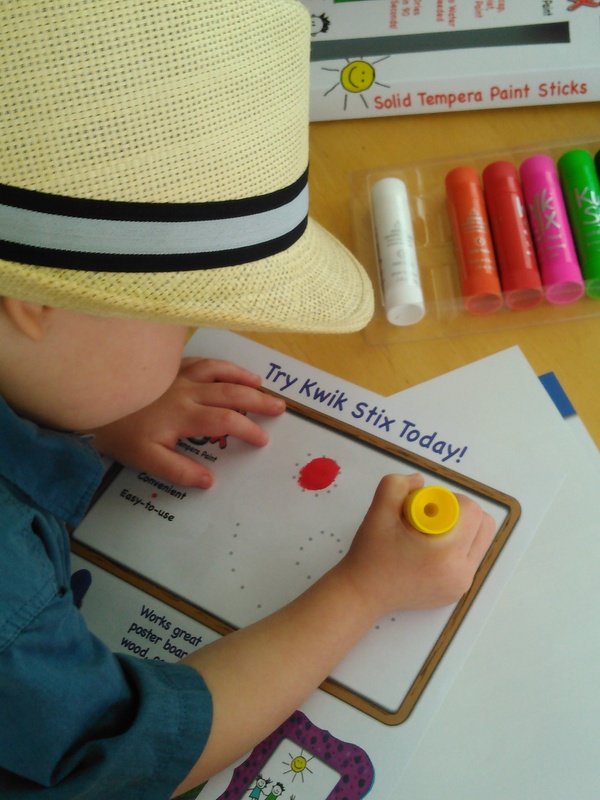 The older three boys and I all tried the Kwik Stix, and we used them on paper and wood. Small Fry painted pretty much any chance he could get; the rest of us used them for specific projects. 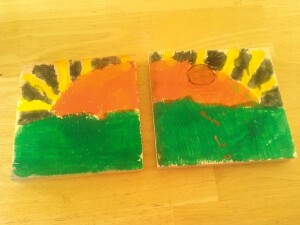 Munchkin expressed his artistic skills to make a two-part painting for my dad for his birthday. He chose to paint a sunset onto a pair of wooden boards he had, and it turned out very nicely. A few months ago, I bought wooden letters representing each boy’s initial to hang over their bed. The previous three were painted with regular liquid paint; since we had the Kwik Stix now, I used those for painting Dragonfly’s initial. I wasn’t sure how it would turn out, but I was very pleased with the coverage I got using them. Just like traditional paint, it did take a few coats, but that’s a lot less of a burden when the dry time is under two minutes versus well over an hour. In addition to the Kwik Stix, The Pencil Grip, Inc. sent us one of their Pencil Grips to try out. These little guys are something I remember from my own schooldays, so it was kind of neat to see one again. Pencil Grips are designed to slide right onto your pen or pencil and help to correct an improper grip. It will work for both right- and left-handed people. Pencil Grips come in a variety of styles (depending on what your improper grip requires for correcting) and a in a plethora of colors. A single grip is available for $1.79. In short, we really loved using Kwik Stix. They were a fabulous way to get more art into our days without making a huge mess or using up loads of precious “real estate” waiting for paintings to dry (although to be fair, that’s never been much of an issue in my house since the boys usually prefer pencil drawings over painting). 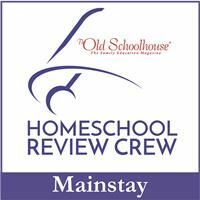 Other members of the Schoolhouse Review Crew are writing about Kwik Stix this week, too, and some of them are also hosting giveaways. Make sure to read those posts for more information about the paint sticks and more chances to win your own set!